How do you take a creamy vanilla cheesecake to the next level? Top it with a simple chocolate ganache and a pile of fresh raspberries and you've got our Dark Chocolate Ganache Cheesecake. Beat cream cheese, sugar and vanilla with mixer until blended. Add eggs, 1 at a time, mixing on low speed after each just until blended. Pour over crust. Bake 55 min. or until centre is almost set. Run knife around rim of pan to loosen cake; cool before removing rim. Refrigerate cheesecake 4 hours. Microwave Cool Whip and chocolate in microwaveable bowl on HIGH 1-1/2 to 2 min. or until chocolate is completely melted and mixture is well blended, stirring after each minute. Cool 10 min. ; slowly pour over cheesecake. Garnish with raspberries. 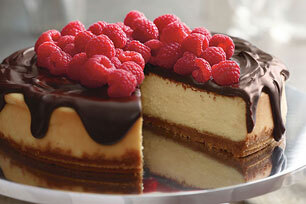 Since this ultra-indulgent cheesecake makes 16 servings, it's the perfect dessert to serve at your next party. Garnish cake with white and dark chocolate curls. Warm 1 oz. Baker's White Chocolate by microwaving it, unwrapped, on MEDIUM for a few seconds or just until you can smudge the chocolate with your thumb. Hold the chocolate piece steadily, then draw a vegetable peeler slowly over the flat bottom of the chocolate piece, allowing a thin layer of chocolate to curl as it is peeled off the bottom to make long, delicate curls. Repeat with Baker's Premium 70% Cacao Dark Chocolate.